Hellbent sees the return of the sassy super thief Raylene - also known as Cheshire Red - who is back to her usual tricks, hired to retrieve a valuable magical artifact. This time however she is up against a very powerful Witch and must team up with x-Navy SEAL and fabulous drag queen Adrian deJesus; juggling two incredibly tricky assignments without losing control of either. Following on directly from Bloodshot, the book has a nice little recap that doesn't take too long but addresses all the important bits so you can read this without having read the previous episode at all (although I do recommend it). Creating an urban fantasy novel that features vampires isn't exactly original, if anything it's a stifled market however Priest manages to project a clear and unique voice that still feels fresh and original, unrestrained by genre. I love this mixture of urban fantasy, quirky humour and lively prose that extrudes from the pages of the novel, the author has such an easy grace that makes reading the book a real joy. The main character of Raylene is also just fantastic, a real personality that mixes a neurotic OCD with intelligence, tough and charming in equal measure with a dry wit and kind of wisdom that only living for over a century will actually achieve. The old tale of Vampires naturally being obsessive compulsive is nicely played out with a tongue in cheek humour. The surrounding cast are just as colourful too, especially the complicated lives of blind vampire Ian Stott and the cross-dressing ex special forces guy / gal Adrian deJesus. There are three main story arcs, one of which gives further depth to the idea of the vampire clan, adding to the already rich world inhabited by Raylene. These separate plots are handled with a great degree of skill but never really converge, I was half expecting to see at least two of them join up and feel it would have strengthened the story. Even though we are dealing with all manner of creatures of the night, this isn't anywhere near as gritty or dark as you might expect and Raylene herself has more humanity than most humans - which in itself is a nice message but rather than de-fang this vision of vampires in general it just comes across as a different style, and one which does work very well. 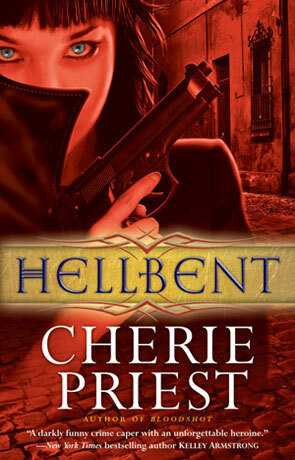 Hellbent is an original, energetic and really fun novel that manages to stand out in a crowded genre, the literal rose amongst thorns. Written on 18th November 2011 by Ant.